The Wire looks at the political map of India to see whether it is true that the BJP is the victim of a gang-up by the others. New Delhi: Since May 2018, one headline has flashed on and off prime-time debates – Modi vs All. It’s followed by fervent questioning: Why are all the parties huddling into a grand ‘conspiracy’ to bring down a lone Narendra Modi? Now that the prime minister has embarked on his 100-rallies-in-100-days programme, we can be sure that we will hear more of the ‘Modi vs All’ claim – both from the man himself, and from the media bandwagon. But is there any truth to that picture in the first place? Will it really be Modi vs All across the country in the coming Lok Sabha polls? While Saturday’s Opposition unity rally – and similar events like it – paint a picture of a joint front against the BJP, this story hides two key facts. First, that in India’s parliamentary system, the outcome of a national election is the sum of the outcomes of contests at the state level and not a presidential fight between two individuals or parties at the pan-India level. Second, that in these state level contests, the BJP is as much a beneficiary of alliances, or gathbandhans, as its opponents. 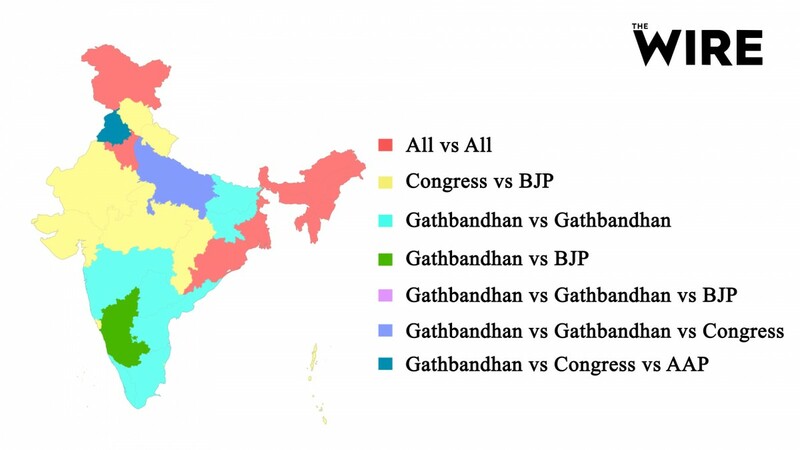 Following a heads-up by journalist Narendra Nath Mishra, who flagged this issue in a series of tweets, The Wire went state by state, examining regional political equations, and testing the notion that the BJP stands alone against a gathering opposition. The picture which emerges is something quite different. The Bharatiya Janata Party has announced that it will fight the 2019 polls with its NDA allies – the Janata Dal (United) led by chief minister Nitish Kumar, and Ram Vilas Paswan’s Lok Janashakti Party (LJP). According to news reports, the JD(U) and BJP will contest 17 seats each in the state and the LJP the remaining six seats – along with one seat either in Jharkhand or Uttarakhand, leaving the rest to the BJP in those states. Paswan will also be given a spot in the Rajya Sabha, most likely from Assam. On the opposition side, though it is not yet official, the Rashtriya Janata Dal (RJD) is likely to share seats with the Congress, the Nationalist Congress Party (NCP), the Hindustani Awam Morcha (HAM), Sharad Yadav’s Loktantrik Janata Dal (LJD), and Left parties. The Congress has already joined hands with an aggrieved NDA ally, Rashtriya Lok Samata Party, headed by Upendra Kushwaha, for the parliamentary elections. The BJP-led gathbandhanswept the state in the 2014 polls, winning 71 of its 80 assembly seats. It seat-sharing arrangement was with a regional player, the Apna Dal. Another smaller ally is the Suheldev Bharatiya Samaj Party. In 2019, Modi faces a daunting pre-poll alliance – the Samajwadi Party (SP) with the Bahujan Samaj Party (BSP). The Rashtriya Lok Dal (RLD) of Ajit Singh is in talks to join as well. The Congress, however, seems likely to go it alone. If there is a lone player in UP, it is not the BJP but the Congress. A two-corner contest between one set of pre-poll alliance partners and another – as it was in 2014. BJP and the Shiv Sena will divide seats to oppose the Congress and the Nationalist Congress Party (NCP). Although top Shiv Sena leaders have been openly abusive to the BJP recently, media reports have called their reunion in 2019 as “inevitable”. If there is a large, non-Congress state where Modi will stand alone against the opposition, it is West Bengal. But here too, it is not ‘Modi vs All’. It is actually Modi vs Mamata. The ruling All India Trinamool Congress (AITC) is going to the elections alone, like BJP is in this state. The Congress may finally ally with the Left or the TMC in the state, but nothing has been formalised yet. So, thus far in West Bengal, every party is contesting the other for all 42 seats. But with the BJP leaving no stone unturned carry the state, it may be essentially a contest between Modi and Mamata. The ruling AIADMK is hoping to make an ally of the Tamil superstar Rajnikanth, who plans to launch a new party before the general elections, and possibly with the BJP. Neither is settled, though, and the Dravidian party has taken a hard line against the Modi government on the Triple Talaq Bill, the Rafale deal and the Citizenship (Amendment) Bill. The opposition DMK has already shaken hands with Congress, the Left and the Makkal Needhi Maiam, the political party launched by another movie icon of the state, Kamal Haasan. It will either be alliance vs alliance, or alliance versus AIDMK vs BJP fight. No sign of Modi vs All. A three-corner contest pits the ruling Left Democratic Front (the CPI(M), CPI and smaller parties) against the United Democratic Front (the Congress, All India Froward Bloc, Kerala Congress (M), Indian Union Muslim League and smaller parties). The BJP, a new entrant, will face the polls alone and on slim odds in Kerala – though it’s trying to win the support of Hindu social organisations like the Nair Service Society (NSS). In the eight northeastern states, where either the BJP or one of its regional partners are in power, it is not Modi vs The Rest either. In Assam, which has the largest number of seats (14), it will be BJP and Bodo People’s Front vs Asom Gana Parishad vs Congress vs the All India United Democratic Front. The AIUDF has expressed interest in being part of the Congress’ developing nation Mahagatbandhan. Aside from the BJP’s regional partner AGP, only the Nationalist People’s Party (NPP) has so far declared that it will contest the polls alone. NPP is in a power sharing arrangement with the BJP in Manipur and Meghalaya. The two states have two Lok Sabha seats each. In the rest of the northeastern states, the BJP faces the Congress and its regional allies. In the lone Sikkim seat, the ruling Sikkim Democratic Front (SDF), a BJP ally, will go it alone. As is traditional, Madhya Pradesh looks forward to a direct contest between the two national rivals in 2019. Smaller parties are contesting separately. A direct contest between the BJP and the Congress. A direct contest between the ruling BJP and the Congress. If any party is contesting the 2019 polls alone in this state, it is the ruling Congress. The BJP is going to the voters in alliance with the Shiromani Akali Dal (SAD). Harsimrat Kaur Badal of SAD is the minister of food processing in the Modi cabinet. Another player in the poll arena is the Aam Aadmi Party (AAP). So it is a three-corner contest in most seats. The BJP pocketed all seven Lok Sabha seats in the capital in 2014. In the 2019 polls, Delhi will see a triangular contest between AAP, BJP and the Congress. Though there was a media buzz that Congress might enter into a pre-poll alliance with the ruling AAP, newly appointed state party chief Sheila Dikshit has ruled it out. More than three rivals – Congress, BJP and the INLD-BSP – have drawn battle lines. A three-sided contest among the ruling Biju Janata Dal (BJD), the BJP and the Congress. The state will elect its assembly simultaneously. Modi (BJP) recently lost a key NDA partner in this state, the Telugu Desam Party (TDP), which has been getting cozy with the Congress instead. This is principally a contest between regional rivals. The state will elect its assembly simultaneously, so their calculations are based more on winning the state than on Lok Sabha seats. The TDP is likely to face the united forces of the YSR Congress Party (YSRCP) – alienated from the national Congress since the death of Y. S. Rajasekhara Reddy –and the Telengana Rashtra Samiti (TRS). Together, they bagged 20 seats in the last general elections. They also have the support of Asaduddin Owaisi’s AIMIM. Recent reports say Jaganmohan Reddy of the YSRCP met K.T. Rama Rao, son of chief minister K. Chandrasekhar Rao of the TRS, to formalise a ‘Federal Front’ – free of both Congress and the BJP – and contest both Telangana and Andhra together. The BJP has entered into a seat-sharing arrangement with the LJP. Together, they face a pre-poll alliance of the Congress, RJD, Jharkhand Mukti Morcha (JMM) and Jharkhand Vikas Morcha (Prajatantrik). Regional parties, the National Conference (NC) and People’s Democratic Party (PDP), and the two national parties are likely to contest against each other. If there is any possibility of an alliance with a regional player presently, it is the BJP which may tie up with the Jammu and Kashmir People’s Conference of Sajjad Lone. A tight contest between the ruling BJP, with its smaller state allies, and the Congress. Besides Delhi, there are also six Lok Sabha seats in the Union Territories. In 2014 polls, Congress won only the Puducherry seat, while BJP bagged four – Chandigarh, Andaman and Nicobar Islands, Daman and Diu and Dadra and Nagar Haveli. The Lakshwadeep seat went to the NCP.